There are a few reasons why the market has crushed Vanguard, which are the very reasons why an investor should steer clear of its units and consider buying Anadarko instead. Data sources: Vanguard Natural Resources, Anadarko Petroleum, Moody's, and S&P Global. In Anadarko's case, the company has an elevated debt-to-cap ratio, which at nearly 50% is much higher than the sub-30% level that the sector considers safe. That said, the company is still rated investment grade by two of the three major credit rating agencies. Further, after several recent asset sales it has a boatload of liquidity. Contrast this with Vanguard Natural Resources, which has an eye-popping debt-to-cap ratio. Worse yet, is the complete lack of liquidity due to the whopping $1.4 billion it borrowed on its revolving credit facility. Those borrowings became a grave problem after its banks cut its borrowing base down to $1.3 billion, leaving the company with a deficiency that it has to pay back in equal installments over the next six months. If the company fails to meet one of these payments, it will be in default, which could force it to file for bankruptcy. Needless to say, Anadarko wins the battle of the balance sheets. Further, most of its assets are natural gas, which has been under more pressure than oil over the past few years. This global focus not only provides greater diversification, but it gives the company options to invest that Vanguard does not possess. One option, in particular, is Anadarko's ability to develop the bulk of its resources internally through exploration. This is in direct contrast with Vanguard's model, which instead focuses on buying legacy oil and gas fields from other producers. That acquisition-driven growth model might have less risk of drilling dry holes, but it is more expensive than exploration on a per barrel basis over the long run. Moreover, this tactic backfired in recent years after the company ran up a huge tab on its credit line buying up assets just before the market crashed. Because of its global focus, as well as its exploration upside, Anadarko has the better portfolio. With its unit price down 95% over the past two years, there is a clear case to be made that Vanguard Natural Resources has enormous upside potential. If the company can make it through the downturn while reducing its debt, then it is entirely possible that its unit price could skyrocket when industry conditions improve. However, if prices crash again, the company would likely join many of its fellow upstream MLP peers and declare bankruptcy. Anadarko Petroleum also has upside when oil prices recover, though not to the same extent. However, it has additional upside from its ability to continue its long history of creating value from its exploration efforts. Over the past decade, the company spent $10 billion on exploration, which resulted in the discovery of 6.5 billion barrels of oil equivalent (BOE) resources. To date, it sold 1.5 billion BOE for $14 billion while retaining 5 billion BOE to drive current production as well to capture future upside through additional monetization. While Anadarko Petroleum might not skyrocket once the oil market is in the clear, it still has a better risk/reward than Vanguard. 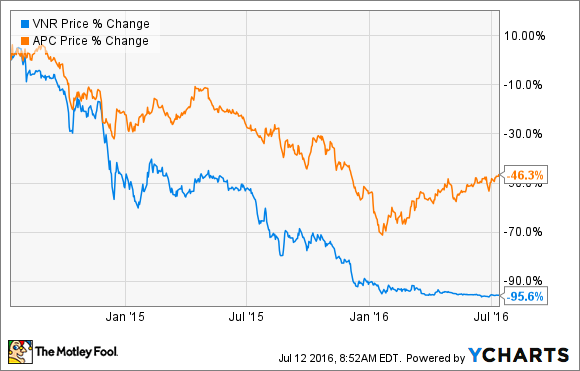 The choice is pretty clear; Anadarko Petroleum is the better option for investors. Not only does it have the balance sheet strength to withstand another drop in prices, it also has a deeper portfolio loaded with upside.